It will soon be 16 years since we bought our apartment in Bagni di Lucca in northern Tuscany. It is easy to remember the date when we first found the town. It was 1st March 2003, my 50th birthday. I am often asked why we decided to buy a house in Italy. The answer is simple, we wanted a base in Europe and Italy was the logical choice for me. I lived in Italy for a year 45 years ago and once Italy gets under your skin there is no shaking it off. My son was born in Sorrento, so there will always be a connection. We did little research. A friend suggested Lucca so we went to Lucca to look for a property. We found several we liked but they cost more than we wanted to pay. I had seen the name Bagni di Lucca on the internet and it wasn’t far away so we drove 30 minutes from Lucca along the Serchio river to find it. 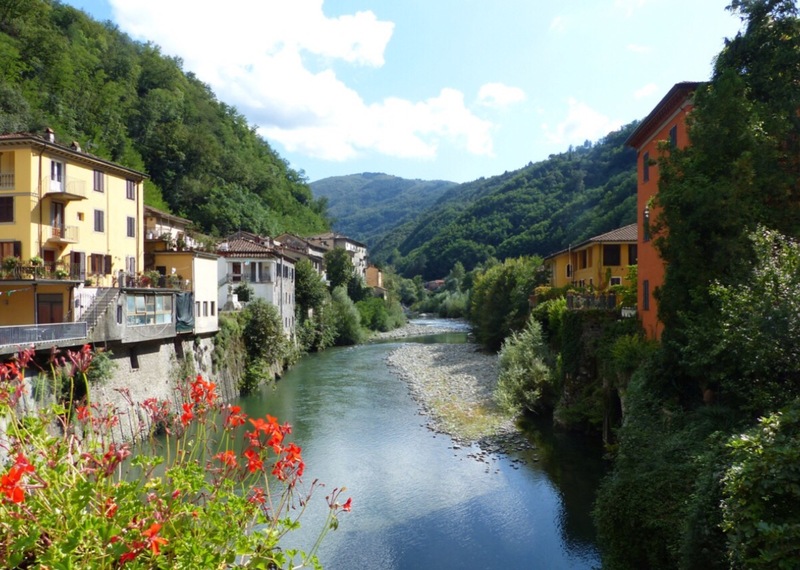 I remember standing on the bridge in Ponte a Serraglio (one of the villages that make up Bagni di Lucca) thinking that if it looked pretty in winter it was going to be even better in spring and summer. We liked that it had a bar, a couple of restaurants, a post office, shop and seemed lively and was close to many things we were interested in. There are ski fields 40 kilometres away. It is close to Lucca and the gorgeous Tuscan and Ligurian coastlines and it is easy to get to Florence, Pisa and beyond. We found our lovely apartment which sits beside the river and is in the centre of our charming village. I can walk across the bridge to our local bar which opens from 6.00am until late and serves excellent coffee, its own delicious pastries, light lunch and evening aperitivo. It is the place where everyone meets. People ask why we would want to go back to the same place every year. I like it because I feel at home in both countries. I arrive in Italy and I am instantly at home and can get on with my second life. We have made lots of local friends, Italians and foreigners from all over the world who have made Bagni di Lucca home. 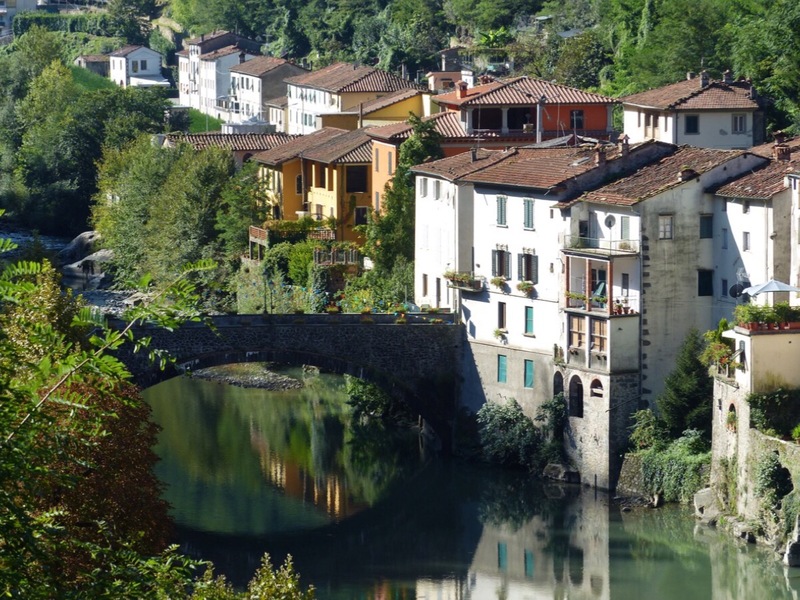 We use Bagni di Lucca as a base to travel all over Italy. We have been to almost every region. We do day trips, or stay a couple of nights and usually do a 2 week trip each year. We have favourite places to visit and find ourselves returning regularly to the Amalfi Coast, Venice, Chianti and Portovenere and surrounds. We also travel to other European countries. We can drive to France in a little over 4 hours and we have driven a few times to Spain and to Germany. A couple of years ago we drove to Croatia, stopping along the way in some fabulous northern Italian towns. On the way home to Australia we stop in a different place each time. Last year we stayed a week in Copenhagen and the year before that in Iceland. This year we are planning a trip to London, Oxford, Bath, Cornwall and Devon. We fly Finnair, so we stop in Helsinki for a few days each time we travel to and from Italy. It has been a lot of fun to spend time in Finland, my grandfather’s country of birth. 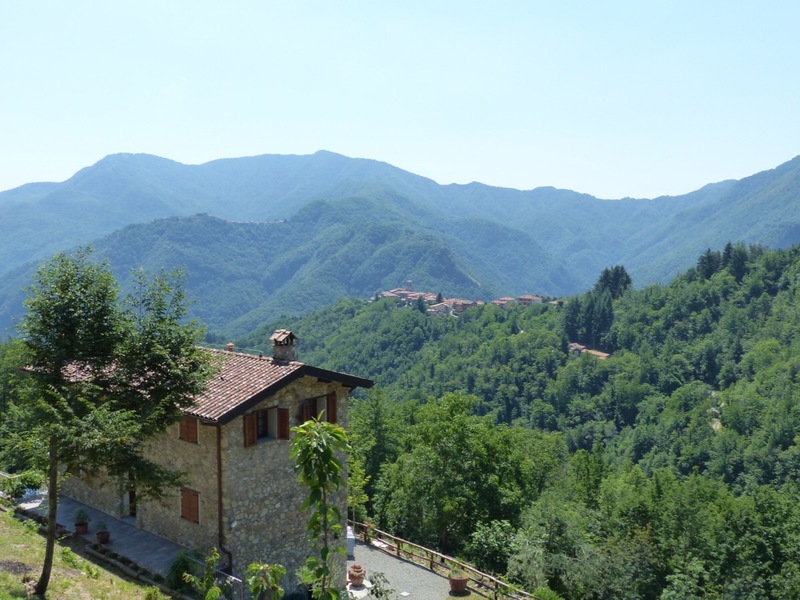 Several years ago we built a house in the mountains near Bagni di Lucca. We began with a pile of rocks and now it is our beautiful Casa Debbio. The house has been finished for 7 years and our garden is an ongoing work in progress. The entire property was covered in brambles when we bought it and it has been a delight to see our garden grow on the terraces around the house. Here is some of our ever expanding garden. We have 350 lavender plants and almost as many rosemary, 65 peonies, olive, chestnut, hazelnut, cherry, fig, quince, apple, pear, peach, pomegranate, persimmon and walnut trees and raspberries, kiwi and tomatoes growing. We had intended to build it and sell it but the GFC got in the way so we decided to furnish it and rent it. One day we will sell it but right now we love it and I would love to see the garden grow for a few more years. This year there will be more peony plantings and probably more lavender and some artichokes…it keeps getting bigger. I think buying a place in Italy is the best thing we have ever done. The apartment was not expensive and spending 6 months in Italy would not be possible or as enjoyable for us without it. Being able to spend that time in Italy has opened up a whole new world. I love Australia and it will always be my home, but I love my time in Italy too. I will be heading off again in about a month, first to snowy Helsinki then on to Bagni di Lucca via Milan. We are planning a trip to Puglia in spring as well as a few other short jaunts. I hope you will follow our adventures on the blog. Thank you. I am very keen to get back to Bagni di Lucca and Casa Debbio. It is very hot here now and I long for some cold weather. There are a few people in Bagni di Lucca now because of our place. It is a lovely place to be. How wonderful to have two lovely countries where you can feel at home -and find adventure and friends, too. Thanks for sharing with us. I hope you enjoyed being back in Italy for a little while. I hope you come back soon. We felt the same way when we first visited Bagni di Lucca some 11 years ago. It took us a while to find what we wanted, as at the time the offer was limited and prices were very high. We never regretted our choice. We are very happy with our decision to buy in the area. We love it. We understand totally Debra. Italy and Greece easily slip in under your skin. We were interested to see the ‘pile of rocks’ you started with at Casa Debbio; you’ve come a long way since. Stunning. Our pile of rocks has exceeded our expectations. We love being there. Thank you. Perhaps you will return one day. My goodness, why would you not have a second home in Tuscany if you could. It’s such a wonderful exchange and i love your travels. I was able to give Brandon a hug today and tonight we are in Ballarat. I hope you enjoyed Curly Flat and that the temperature had cooled a little. Have a nice…Back to Italy! Amazing story Debra! I remember when you reached Monte Amiata too and visiting my exhibition in the medieval fortress in Piancastagnaio (Siena). Grazie e buon viaggio! We really enjoyed meeting you in Piancastagnaio. I hope you are well. Living my dream. I live on the Gold Coast and while I love Australia and all we are blessed with, I dearly would love to ‘one day’ have a base in Italy like you do (I’m sure I must’ve been italian in a past life!). Wonderful read… it intrigued me how you go with all the legalities of it all… for now I’ll live through you.. There are lots of difficulties associated with owning a property in another country, but it is worth the bother. I hope you achieve your dream one day. Yes why would you not have a base in Europe if you can, and Italy is a fantastic country, we love going there too. Casa Debbio looks great, what an achievement ! and I’m very envious of your beautiful garden. I can’t wait to see my garden spring to life in a couple of months. I always amazes me. Always have enjoyed your posts Debra! Our dream is that one day we can call a place in Italy our second home. We do love the lakes region and have been there many times. My ancestry way back is Italian and therefore feel a connection with beautiful Italy as well as learning the language. Thank you for sharing your travels and Bagni di Lucca. I love Lake Como, especially Varenna. We hope to explore Lake Maggiore this year. Beautiful post to read on a winter Sunday morning in NJ! I am recently retired and planning to spend next year in Italy. I agree that Italy gets under your skin! I have two questions: how could I reserve your apartment? ; and what type of visa do you have to spend half of each year in Italy? A year in Italy sounds wonderful. I spend 6 months each year in Italy and 6 in Australia. You need to apply for a visa in your home country then apply for a Permesso di soggiorno once you get to Italy. It is quite an involved process. I will send you a link to a post I wrote about it. The procedure may be a little different in USA. I will send an email about renting our property. An absolutely delightful post. For me, it connected many dots for me. Thanks. Just recently I was thinking about that valley and the feeling is gives me by touching my heart. Safe journey! The other question I am often asked is when I am going to move to Italy permanently as I have a house there. That won’t happen. As much as I love Italy I am very happy with my life in Australia and fortunately don’t have to choose between the 2. You are simply taking advantage of the best of both worlds. 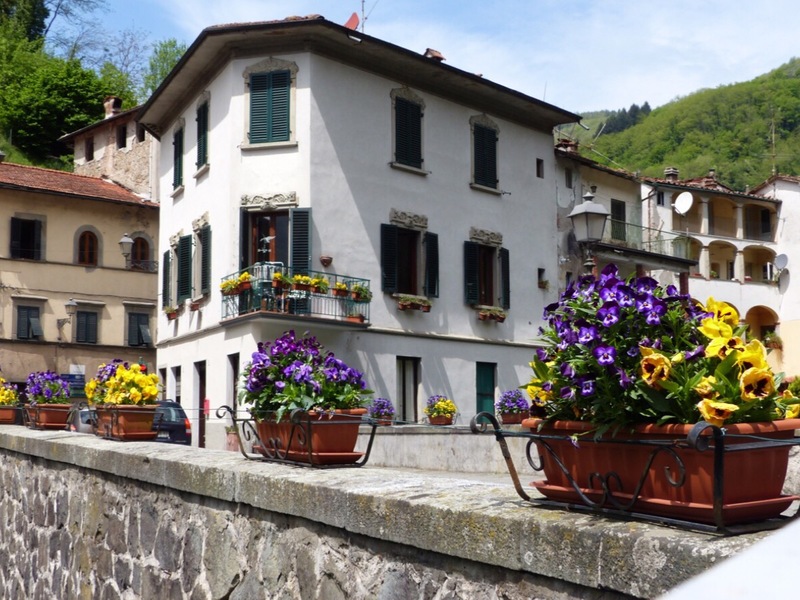 Another wonderful post Deb…….as you know we have loved visiting and being graciously entertained by you and Jim in both of your Italian homes and listening to you share your knowledge of local lore and history. See you soon…..we arrive on 2/28 in Lucca……new apartment this year…..casa Casina on San Giorgio. I arrive on 3rd March, a bit later this year. I look forward to seeing you soon. What a lovely post, thank you for sharing the background and details of the life and home you have built in Italy. Italy was always going to be my first choice. I think there are more beautiful things per square inch in Italy than anywhere else. There are many difficulties along the way, but it is worth the trouble to live in such a beautiful place. What an informative and well written piece. Thank you. We feel very lucky to ba able to live in 2 countries. I hope everything goes well for you and that you can come to Italy soon. A perfect life for me would be half year in Italy and half in Maine. I’m 50% there! I spend 6 months each year in Italy. I will go next month and be there for 4 months, then come home for our perfect winter in Brisbane then back to Italy for a couple of months in autumn…perfect. Makes complete sense to me that you chose Italia. A divine place to plant your feet. It most certainly is divine. I love reading your posts Debra! This one could almost have been written by me, in as much as the reasons why we bought in Italy, ( Todi, Umbria) and the reasons why we adore our lives in both countries, are pretty identical! It has indeed opened up a fabulously rich and very fulfilling life in a world so adorably different to our life on Sydney’s Northern Beaches. Absolutely the best of both worlds, half the year travelling from our base in Todi, half here on the coast. Happy Travelling to you both! May even cross paths in Devon or Puglia, both on our list this year. There are challenges to making a life in Italy, but you just have to work it out and get on with it. It is definitely worth the effort. I love Todi, it is a gorgeous town. We must revisit. I do like returning to places. There is always something new to discover. We would love to meet you if you are ever thinking of a return visit. Or if we come north to Bagni di Lucca. We spend almost the same times of the year in Italy as you do. How fortunate we are. We will let you know if we come your way and please contact us if you head north. Ciao, ci fa piacere sapere che adorate l’Italia! Noi siamo di Ascoli Piceno, (Marche )e amiamo conoscere persone nuove. Se venite da queste parti non esitate a contattarci. Abbiamo un bellissimo posto in campagna da visitare e dove praticare un rilassante turismo agricolo! We are in our 70s, and had spent 4 autumns in Pienza as of 2016, following about 10 trips to italy to cycle. We had friends there, and after the US 2016 elections, we decided to spend more time in Italy. We bought an apt in town, and will never regret doing so – our apt came with two lovely patches of garden, one for herbs and lilacs, the other for followers and a sitting area plus two fruit trees. 183 days a year of community and lovely friendships. If a foreigner stays longer, Italian taxes become a liability. We think Lucca is the sweetest city in Italy, and go there almost yearly, but Pienza is the town of our hearts. We chose to have no car, and to travel for a few weeks each year before or after Pienza, not using it as a home base, but rather to become part of the fabric of the town, easier to do there than in the countryside. Non vediamo l’ora di ritornare. Can’t wait til we get back there, old friends and family here, aside. I love Pienza! It is one of the towns we visit regularly. We love the drive from Siena to Pienza via Asciano. The road takes you along the top of Tuscsny’s rolling hills…delightful in any season. I know about the 183 days thing. I have a Permesso di Soggiorno, but stay 6 months and 1 day in Australia. 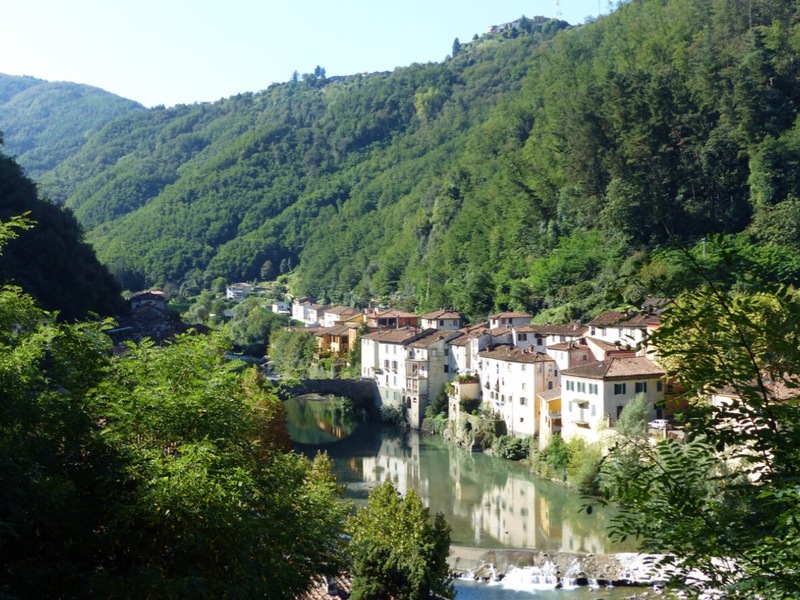 We feel part of the community in both Bagni di Lucca and Vergemoli, where Casa Debbio is. Perhaps we will meet in Pienza one day. We have recently visited Pienza too. How delightful to live there. And wise to adhere to the 180 day limit, despite us also having a 1 year Permesso. Debra, thank you for sharing your love story with Italy, now I understand that it goes way back where it started. I migrated to the US from Germany 29 years ago, but the country I miss the most is going to Italy. It’s just embedded in my heart. We have friends in Germany and enjoy our visits there too. Living in Italy gives us lots of options, much easier than from Australia. And I have to ask “Why not!” Italy is the land that so many people dream about, want to visit, want to replicate the cuisine – every single person I have told that I have just bought a little place there get all goggle-eyed and want to know every detail. Most people offer to come and help me with the renovations just so they can be part of it and the Italian Dream! A dream you are already living. Congratulations on the decision you made sixteen years ago. We get lots of visitors. Italy is a popular destination. We are happy with our choice. Not doing any research worked for us. Debra, please add my wife, Betsy, and me to your rapidly growing list of fans. Three years ago, we rented an apartment in Radicondoli, west of Sienna. It was a wonderful experience which included some flirtations with real estate. You mentioned that “GFC” got in the way of selling your current house. Please, what is GFC? GFC is the global financial crisis which hit the world in 2009. Property prices fell everywhere making it pointless trying to sell the house. Anyway, we are happy that we didn’t sell it. We love our mountain house. I just lived in italy​ with my parents for three months in a home they recently purchased in monforte​ de alba​, piemont​​e. But I loved it so much and plan to keep going back for my entire life! Your beautiful pictures and amazing stories are giving me a case of wanderlust! Thanks for sharing your piece of heaven! We feel very fortunate to be able to spend so much time in Italy. Love your story of moving to Italy. I visited Sienna this past summer. Loved it. After reading all you have done makes you want to do the same. Continue enjoying all your accomplishments!! Siena is one of our favourite towns to visit. It is only a couple of hours away from our house so we try to go often. What a global life you have. Was it difficult to purchase a property in Italy? Not really, the purchase was OK. The difficulties are navigating the rules and regulations of living there. Con le figlie grandicelle ed il ragazzo del Paraguay che starà con noi un intero anno, vorremmo iniziare a visitare la bella Toscana. Un giorno vi contatteremo per avere maggiori informazioni sul vostro nido ! 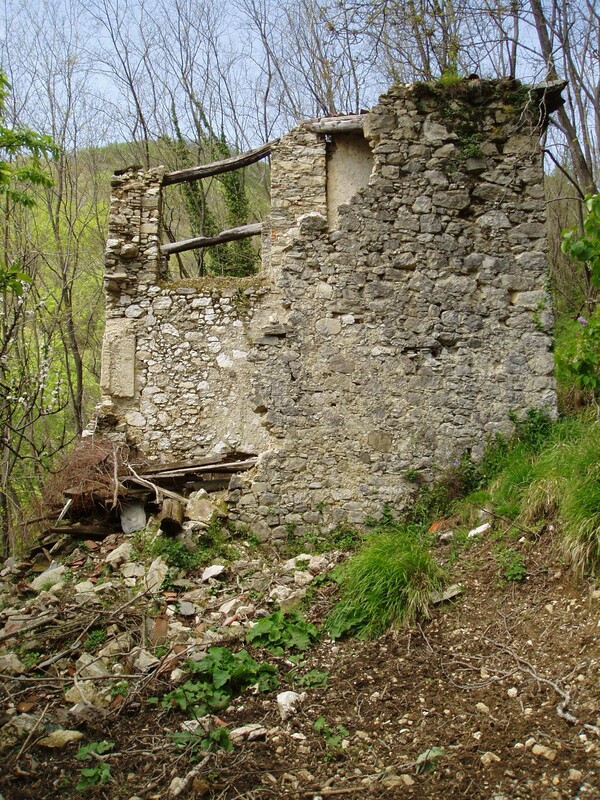 Anche noi abbiamo del terreno edificabile in vendita, sia a Polesio, con la vista dei caratteristici Calanchi e sia ad Ascoli Piceno, zona centrale. Chiunque fosse interessato potrà contattarci qui. I can’t tell you how it makes my day to read and see pictures of your adventures in Italy! It’s a bit like living vicariously. Although I hope to visit many of these magnificent places someday, I feel at least I have been given a taste through the eyes of someone who loves and appreciates Italy like I do. Italy is very beautiful and we feel very lucky to be able to spend time there. What a beautiful home you’ve created, Debra. I’ve often thought I’d like to live in Italy but don’t know how I would get on with learning the language. Such exciting travel plans too. I look forward to your photos. Learning Italian I see an ongoing task. We love our months in Italy. You have done really amazing work with building this beautiful house and garden. You are also really brave to just start from a pile of rocks in the mountains. It took 2 years to build the house and the garden is still a work in progress. I’d like to stay here longer, live like a local. What city (not tourist) should I visit before returning home? That is a big question. I don’t know where you have been or how long you have there. Don’t avoid popular places, they are popular for a reason. I like Lucca, Pistoia, Siena, Pienza, Pietrasanta, Orvieto, Pitigliano, Arezzo…the list is long. Thank you for the response! I’ve been to Florence and Rome. Now I would like something more authentic. I’ll see the cities you wrote about. I have about 10 days left, and then I have to go back.